To Cite: Malakan Rad E, Zeinaloo A, Kariminejad A, Kornak U, Fischer-Zirnsak B, et al. Novel FBLN5 Mutation of Congenital Autosomal Recessive Cutis Laxa With Isolated Right Ventricular Non-Compaction (RVNC): New Findings on Echocardiographic Speckle-Tracking Strain Imaging of RVNC, Iran J Pediatr. 2016 ; 26(6):e6135. doi: 10.5812/ijp.6135. 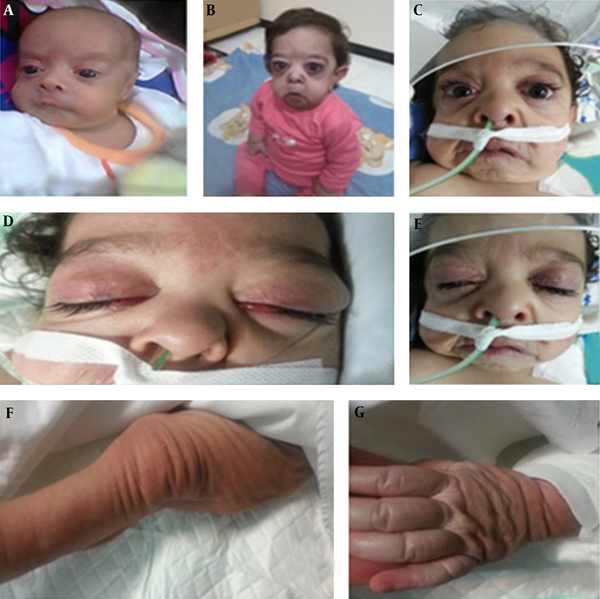 We report on a novel mutation in a two-year-old child with autosomal recessive cutis laxa with severe generalized laxity of the skin, prematurely aged appearance, conjunctival chalasia, episodes of severe rectal prolapse, isolated right ventricular non-compaction, (RVNC), significant pulmonary hypertension at the systemic arterial pressure level, severe tricuspid regurgitation, corpulmonale secondary to recurrent pulmonary infections, and mixed pulmonary fibrosis and emphysema. Next generation sequencing of cutis laxa genes identified a novel homozygous mutation in the FBLN5 gene (homozygous sequence alteration of c.907C > T [p. Gin303*] FBLN5 [ENST00000342058]). Despite severe and generalized disorder in the patient’s connective tissues, she had no primary valvar or vascular abnormalities in the heart. Complete speckle-tracking strain imaging (SI) by two-dimensional echocardiography showed decreased systolic longitudinal and transverse strain in the involved segment of the right ventricle (RV). Cutis laxa (CL) is a rare dermatological disease secondary to disordered elastin formation. It may be congenital or acquired. Congenital CL may be autosomal recessive, autosomal dominant, or X-linked. Autosomal recessive CL (ARCL) is divided into five subtypes: type 1A, type 1B, type IIA, type IIB, and type III. Aortic aneurysm has been reported as a common finding in type 1A (1, 2). We report a new case of ARCL type 1A with a novel FBLN5 mutation, right ventricular non-compaction, and no arterial or valvar involvement. A two-year-old child with a known diagnosis of ARCL type 1A was referred to the pediatric cardiology clinic with cyanosis, generalized edema, and mild respiratory distress. She was born to consanguineous parents (first-degree cousins). The first offspring of these parents was a healthy six-year-old boy. The second pregnancy was aborted due to unknown reasons at 24 weeks of gestation, and the third child of the family was our patient. The child had a history of multiple hospital admissions for pulmonary infections since early infancy. On physical examination, she was cyanotic with no clubbing. Her weight and height were below the 5th percentile for age, and her mental and motor development were normal. Her abdomen was protuberant secondary to a combination of ascites and abdominal distension. She had a prematurely aged face, down slanting palpebral fissures, periorbital edema, sagging cheeks, a long philtrum, a prominent nasolabial fold, severe wrinkling around the mouth, downturned corners of the mouth, wrinkling and skin folds in the trunk and limbs, hyperlaxity of joints, circumferential lines around the limbs, bilateral inguinal hernia, and abdominal hernia (Figure 1). A comparison of the clinical features of this patient with the previously reported cases with ARCL type 1A is shown in Box 1. A, shows the megalocornea at the neonatal period; B and C show the prematurely aged appearance of the child; C indicates the conjunctival chalasia due to chemosis; F and G show the wrinkled left leg and left hand of the patient. 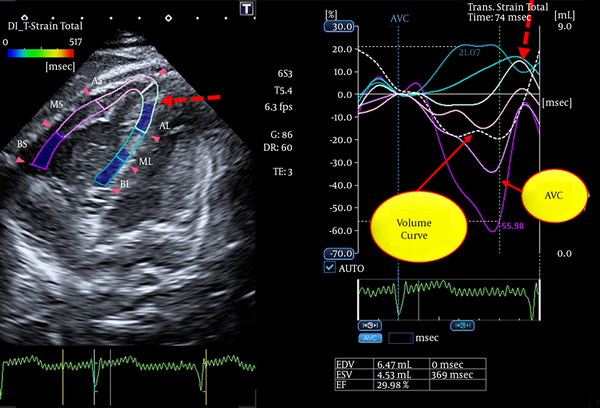 Cardiac auscultation revealed a loud P2 and a holosystolic regurgitant murmur of grade 3/6 in the tricuspid area. Electrocardiography revealed right-axis deviation and right ventricular hypertrophy, and a chest X-ray showed right atrial and ventricular enlargement and consolidation in the right lung. Echocardiography also revealed significant enlargement of the right atrium and right ventricle, remarkable segmental right ventricular non-compaction near the right ventricular apex, and severe tricuspid regurgitation (TR), with a pressure gradient of 74 mmHg. 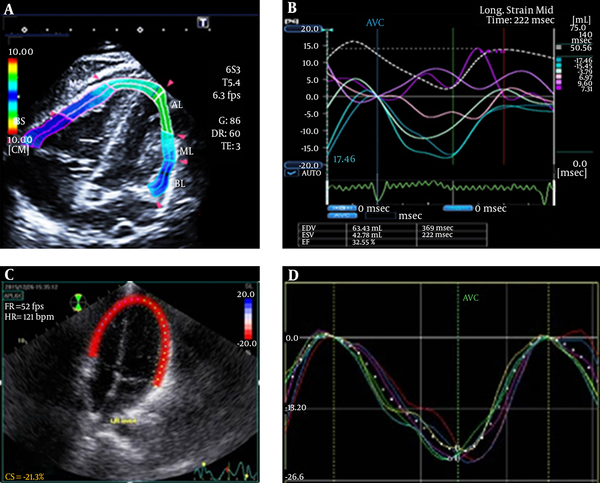 Tricuspid annular systolic excursion (TAPSE) was decreased (12 mm). The inferior vena cava diameter was dilated and did not collapse with inspiration, indicative of an RA pressure of at least 20 mmHg (Figure 2). Hemoglobin and hematocrit were 18 gr/dL and 61.3%, respectively, suggesting chronic systemic oxygen desaturation. Cardiac computed tomography angiography (CCTA) re-confirmed RVNC and excluded pulmonary thromboembolism. The patient’s aorta was normal in diameter from the root to the bifurcation into iliac arteries. A high-resolution computed tomography scan (HRCT) of the chest demonstrated linear collapse consolidations, areas of emphysema, fibrosis, and pulmonary infection in the right lung. The patient’s brain CT scan was normal. After admission, treatment with digoxin, furosemide, spironolactone, and sildenafil was started, and non-invasive ventilation was applied. Shortly thereafter, the patient underwent intratracheal intubation and mechanical ventilation due to progressive worsening of her respiratory condition. After a few weeks, there was significant improvement of peripheral edema, ascites, and signs of right-sided heart failure; however, the patient continued to have a distended abdomen due to distension of the intestines that waxed and waned over time. 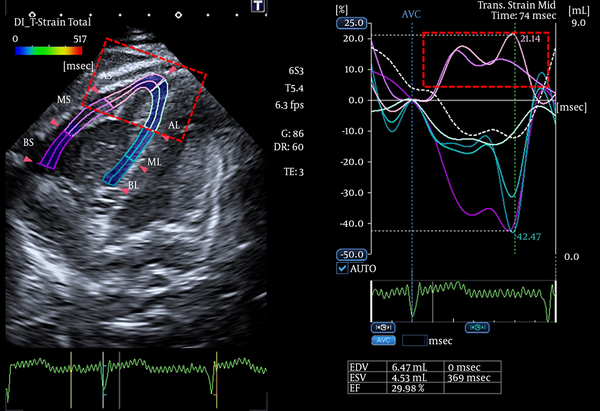 After initial stabilization, we performed a comprehensive systolic and diastolic strain study by 2D speckle tracking echocardiography using the wall motion tracking (WMT) software of an Aplio 300 Toshiba cardiovascular echocardiography machine (Toshiba Medical Systems, Europe, B.V.) (3). We measured the RV systolic and diastolic strain and strain rate and displacement using the full right ventricular and left ventricular volume method (4). - Abnormal positive longitudinal strain in the opposing walls to the segment with RVNC (Figures 4 and 5). The curve in blue turquoise color shows the longitudinal strain (LS) in the non-compacted segment, and the light pink curve indicates the LS in the opposing wall. - Abnormal biventricular total longitudinal systolic and diastolic strain, which may be indicative of RV-LV interaction (Figure 6). Figure 6. Comparison of biventricular strain in our patient with cutis laxa and RVNC with an age-matched normal child referred to the outpatient clinic for a benign murmur (N.B. the lower panel echocardiography was performed using a Vivid 7 echocardiography machine [GE Healthcare]). - Decreased longitudinal and transverse strain in the segment with RVNC. - Decreased right atrial ejection fraction relative to the left atrial ejection fraction (EF). We also assumed that an examination of the outer layer of the septal wall of each ventricle can provide information about the interventricular septum. By comparison of longitudinal displacement of the septal outer layer of the RV and LV, we found that the difference in quantity of displacement between the base and the apex was higher in the RV than in the LV (7 mm versus 3 mm). Furthermore, the outer layer of the RV at the level of the segment with non-compaction had negative displacement at the end-systole (Figure 7). The outer layer of RV at the level of the segment with NC shows negative displacement at the end-systole (white arrow on B). B). (In each ventricle, the curves of longitudinal displacement of the opposing walls during systole and diastole are marked by yellow and red filled bullets on the curves). ARCL type 1A is a very rare congenital connective tissue disorder (5). We report a new homozygous mutation of FBLN5 (homozygous sequence alteration of c.907C > T [p. Gin303*] FBLN5 [ENST00000342058]). This is also the first report of ARCL type 1A with isolated RVNC. We used two diagnostic criteria-hypertrabeculated to compact ratio > 3 and the maximal systolic thickness of the compacted septum < 8 mm for confirmation of diagnosis of RVNC (6, 7) On speckle tracking strain imaging of all four cardiac chambers in this case, we found reciprocal abnormal segmental findings in the walls opposed to the segment with RVNC. We suggest that the interventricular septum merits further study by speckle-tracking 2D-echocardiogaphic strain imaging. We accept that distinguishing the separate roles of RVNC and pulmonary hypertension in the aforementioned changes is only feasible if we repeat the examination after complete treatment of pulmonary hypertension. 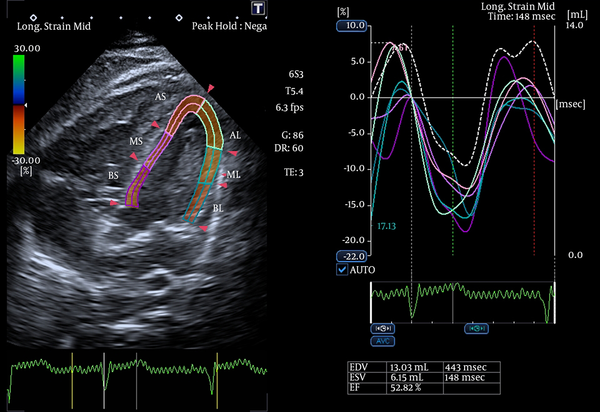 Speckle-tracking 2D-echocardiography facilitates measurement of EF in all four chambers, regardless of the geometric assumptions needed in previous methods (8, 9). We propose the ratio of total atrial EF to total ventricular EF as an index of total cardiac function. However, this index must be validated, and normal values must be obtained. Callewaert et al. and other investigators have reported pulmonary emphysema and vascular complications as two main characteristics of ARCL type I (10, 11). However, our case with the novel homozygous mutation has limited segments, with pulmonary emphysema and no vascular involvement. The dilated pulmonary artery in our case is due to long-standing severe pulmonary hypertension (PH) secondary to long-standing pulmonary disease. Severe tricuspid regurgitation was due to annular dilation secondary to right-sided heart failure. After rigorous medical treatment, tricuspid regurgitation was completely improved. Further investigation is necessary to explain the dilemma of diverse genotype-phenotype correlations in ARCL and the absence of primary involvement of cardiac valves and vessels despite severe, generalized elastinopathy. Ventricular non-compaction is a genetic cardiomyopathy. Isolated RVNC in infants and children is extremely rare, with less than five cases reported to date (12). Neurologic evaluation is essential in patients with ventricular non-compaction (13). Neurologic examination of our patient was normal. We addressed the reciprocal effects of RVNC on the opposing walls and on the LV in this study. In summary, we introduced a novel mutation of ARCL type 1A with an isolated hereditary cardiomyopathy (RVNC) not previously reported. Authors’ Contribution: All the authors contributed to the final revision of the manuscript. Elaheh Malakan Rad drafted the initial version, carried out the echocardiographs, and performed the revisions. The co-authors and Ariana Kariminejad performed the genetic study. Financial Disclosure: The authors have no financial disclosure to declare. Funding/Support: The authors received no funding or support. Statement of Parents’ Consent: Parental consent was obtained for publication of this case and the illustrations of the patient.